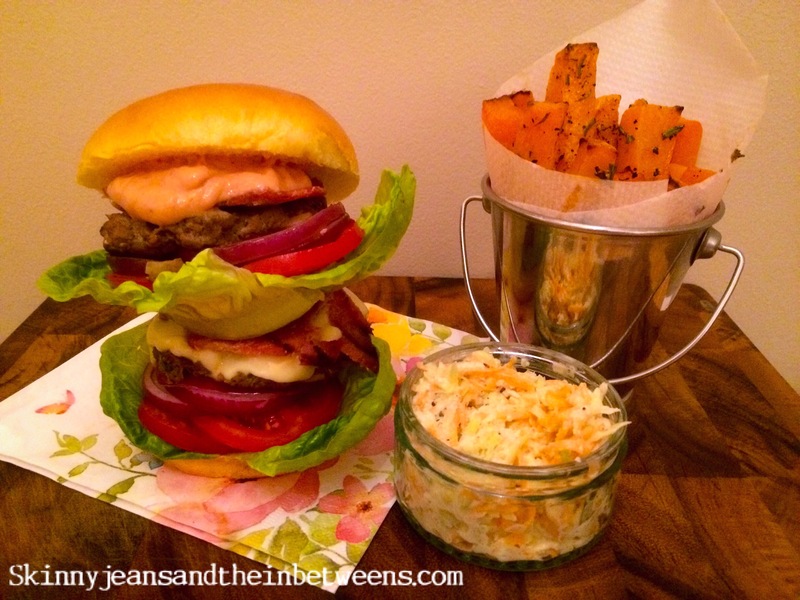 All of this can be yours for just 11 propoints (6pp F&H) who said Healthy Eating can’t be fun! 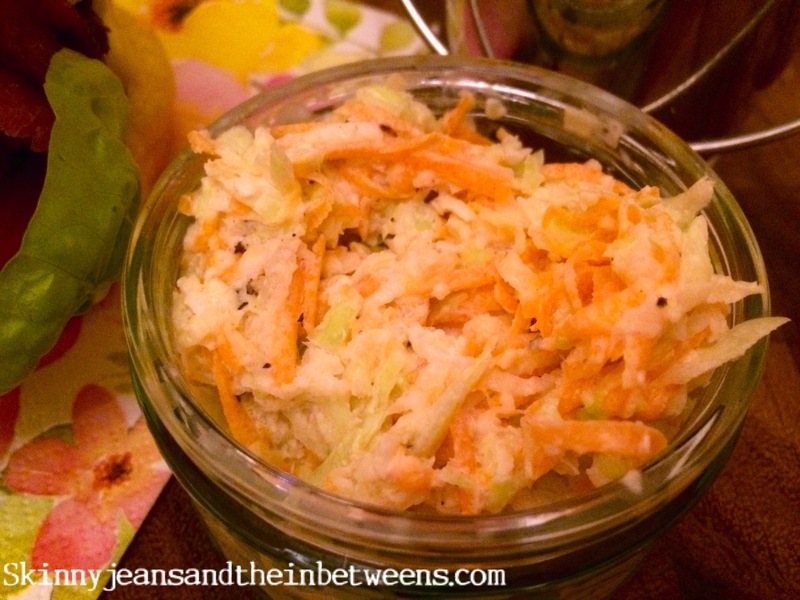 Grate the Carrot & White Cabbage in a food processer using the grating attachment. Place in a bowl with the crème fraiche & season with salt & black pepper. Cover with cling film & refrigerate until needed. Mix all the Taco Sauce ingredients well in a bowl until fully combined, cover with cling film & refrigerate until needed. Meanwhile combine all the burger ingredients together well in a bowl, try not to compact the meat too much with your hands, lightly mix it to avoid dense burgers. Divide the mixture into 8 meatballs & flatten them down to form 8 thin burger patties (these are thinner than my usual burgers but you get 2 so it’s essentially the same amount of meat in the end). Some of the diced onion might not make it into the patties & get left in the bowl this is fine the onion is for flavour & also to bulk the burgers out so don’t worry too much about leftovers as long as all the meat is used. These can be made in advance & covered & refrigerated until needed if necessary. Preheat your oven to 200c. Blot the Butternut Squash Fries with Kitchen roll to remove any additional moisture & Place them in a single layer on a baking tray lined with baking paper & sprayed with oil. Spray the chips with oil & season with salt & black pepper & scatter with the chopped Rosemary Leaves. Bake for 15 minutes, take out of the oven for 15 minutes & place back into the preheated oven for a further 15 to 20 minutes. Fry the red onion rounds & bacon in a hot pan sprayed with oil for approximately 5 or 6 minutes or until cooked through. Remove from the pan & keep warm. Fry the Burgers in the hot pan sprayed with oil for approximately 3 minutes each side or until fully cooked through & browning. 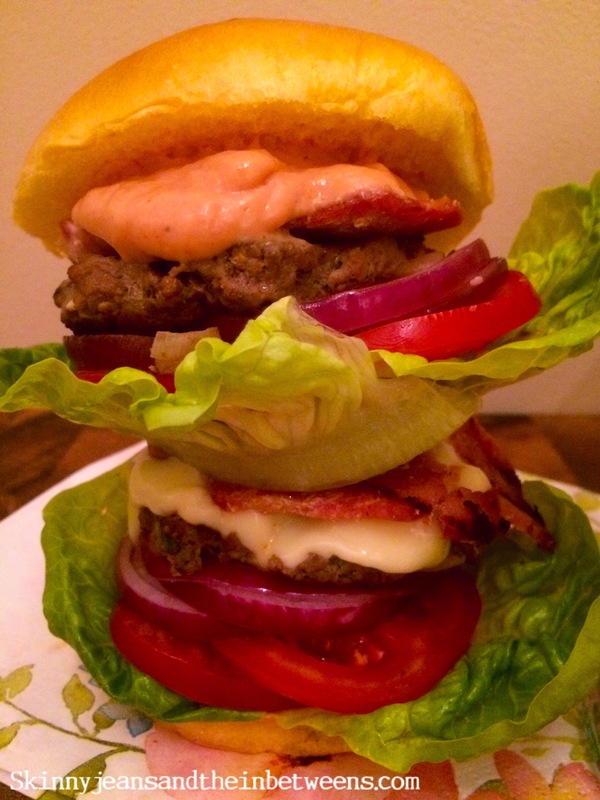 Assemble the 4 burgers by laying the lettuce, tomato & red onion on your bun, lay a burger on top & a cheese slice & bacon medallion on top of each burger. Repeat this layer topping with the taco sauce instead of a second cheese slice. 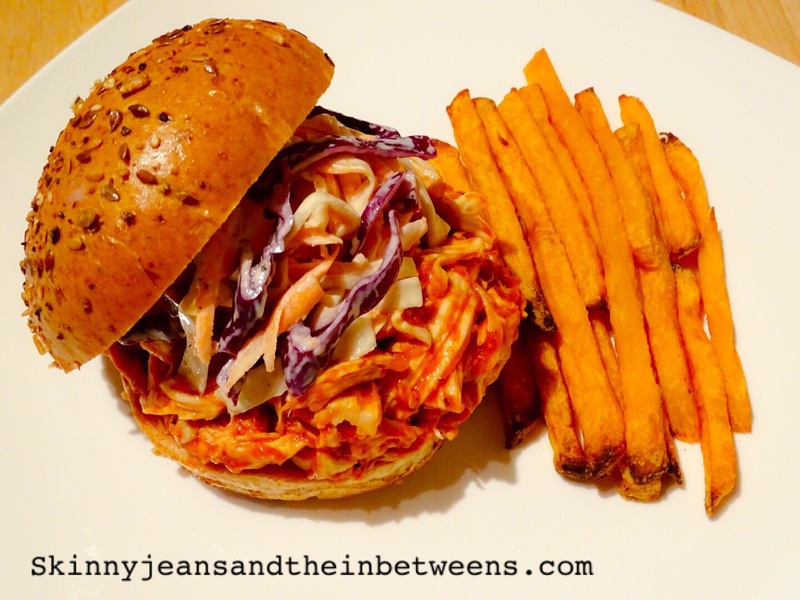 Top with the bun lids & serve with the butternut squash fries & the coleslaw & Enjoy! Hot Diggity Dog! If you have lil ‘uns in the house you’ll know the hotdog song off by heart, you probably sing it in your sleep if you’re anything like me! 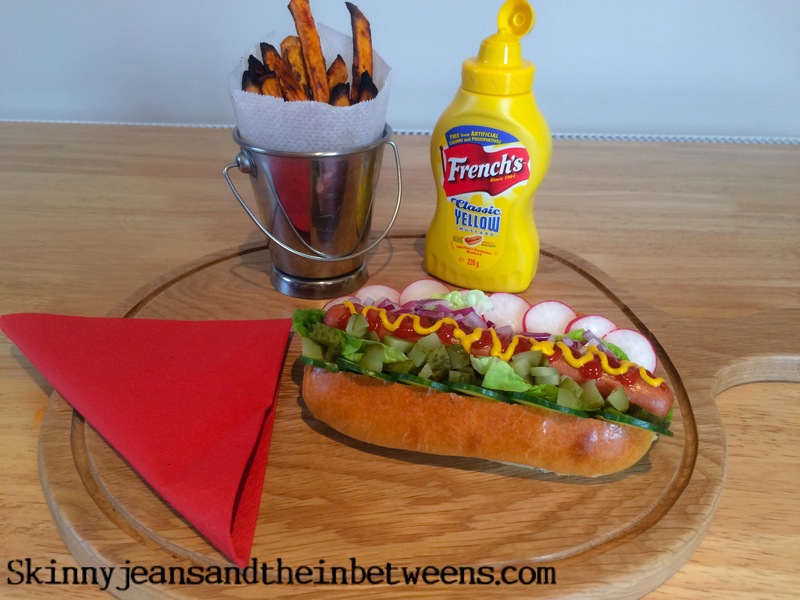 Anyway I suppose I had hotdogs on the brain (thanks Mickey Mouse) so here is my humble contribution to the cause. Only 11pp & just 7pp on F&H, yummy in my tummy! These ingredients are per serving as these would be perfect to pop on the BBQ in the Summer so adjust according to how many people you’re feeding. 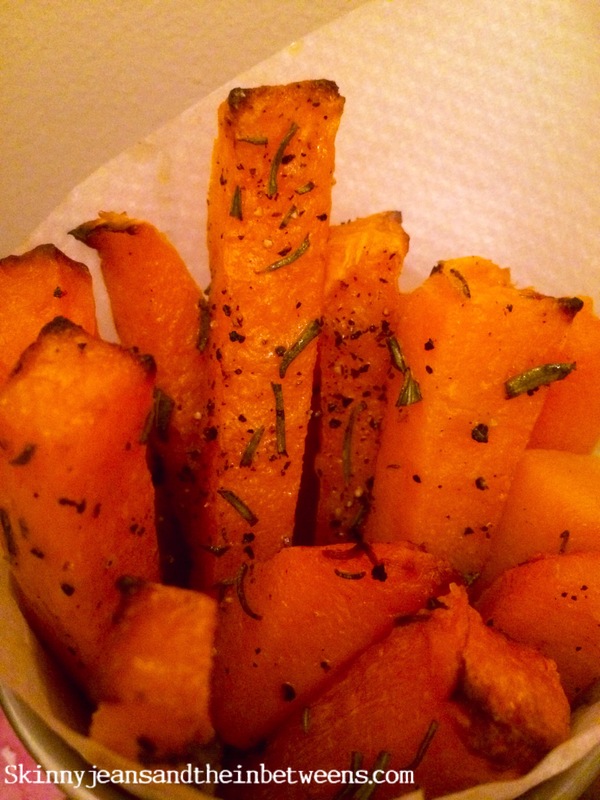 Preheat your oven to 220c & cut the sweet potato into skinny fries. Spray them with sprayoil & pop them in a bowl with the paprika & garlic granules, season with salt and pepper & coat the fries well. Place on a baking tray lined with baking paper & cook for approximately 20 minutes or until cooked through. Meanwhile chop all your salad vegetables. Cook the bratwurst according to instructions (namely microwave covered for 30 seconds) then pop them onto a hot sprayed griddle pan or onto the Barbeque until slightly charred (a few minutes each side) toast the brioche bun if desired. 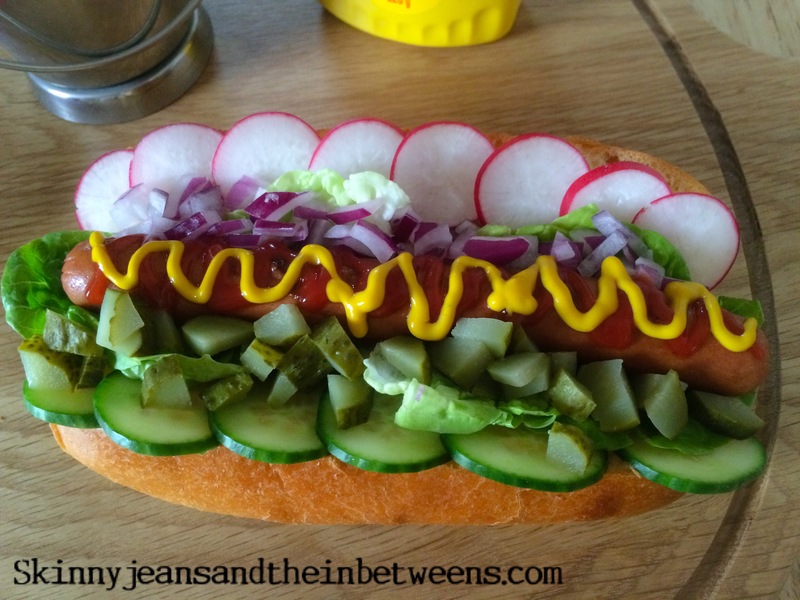 Lay the bratwurst onto the gem lettuce in the bun & adorn with all your chosen vegetables. 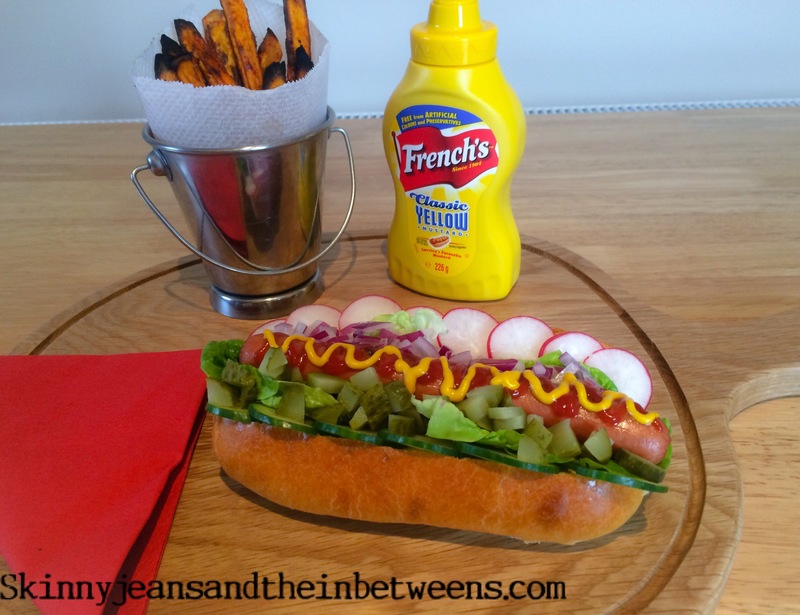 Drizzle with Ketchup & Mustard & Serve with the hot fries. Enjoy!